If you make, fix, invent, repair, craft, woodwork, metalwork, glasswork, solder, take apart, print, hack, or model, you might just want to check out the Maker subculture that is booming all over the world right now. In an era of infinitely disposable and replaceable consumer products coming off the assembly line, some people have taken the time to create and make their own things at home or in their garage. Crafting and hobbies aren’t new, not by a long shot. But this movement take advantage of the ubiquitous tools available to more and more people to design and create according to their whims. Makers are not just consumers but designers and producers, engaged in the process of discovery. And we think citizen science fits right in. With citizen science, anyone can join in to the process of making scientific discoveries. 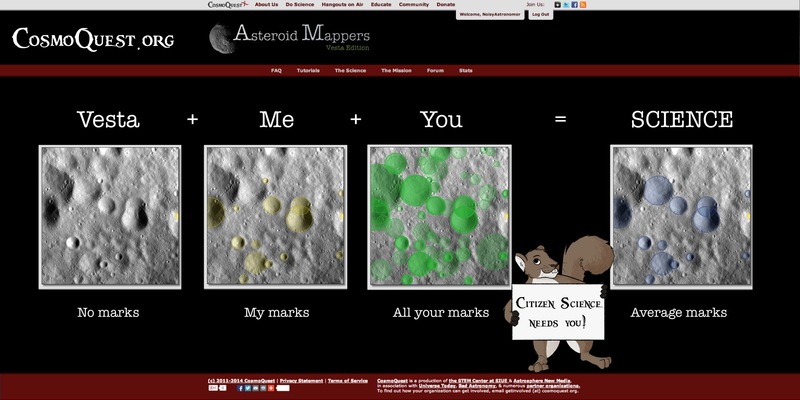 All of us together are mapping the surfaces of other worlds. But that’s not all. CosmoQuest is a community of scientists, educators, programmers, artists, and communicators who work together to produce science and educational content here on the site. We’re grateful for and enjoy all of these contributions. So we’ve loaded up our van to share what we’ve made together at the Kansas City Maker Faire this weekend. We hope you can join us if you are in the area! We’ll have citizen science on the website, the Earth or Not Earth app and other games from Space Play, flour and cocoa powder craters and dry ice comets, space crafts, and more. We’re looking forward to the adventure!